In this video you can see the steps for adding a slicer to a pivot table in Excel 2010, and then using slicers to filter the data. The written instructions are below the video. 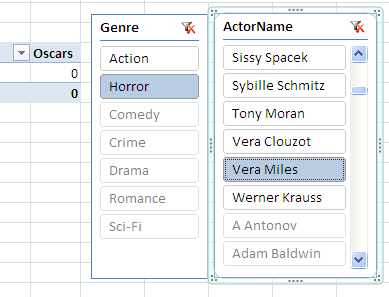 Introduced in Excel 2010, Slicers are a powerful new way to filter pivot table data. On the Ribbon's Insert tab, click Slicer. Click on an item in a Slicer, to filter the pivot table. Other Slicers will show related items at the top. In this video, you'll see the steps for connecting multiple pivot tables to a slicer, so they can all be filtered with a single click. This video shows how you can use a single Report Filter, connected to a slicer, to update multiple pivot charts. The slicers are stored on a different worksheet, so they don't take up room on your Excel dashboard sheet. 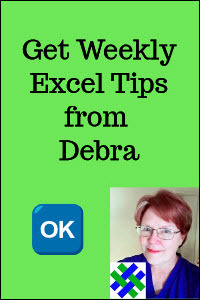 Watch this video to see how to set up the pivot tables and the pivot charts, and connect them to the slicer. Slicers, combined with a pivot table's Drill to Detail feature, can produce unexpected results. See the problem in this video. Update older Excel files, if you want to use Slicers with the pivot tables in those files. Occasionally, there is a problem updating a pivot table, so you can try to repair it, by following the steps in this video. Written instructions are below the video. Usually it's easy to add a Slicer to a pivot table, but for files that were created in older versions of Excel, you might need to update the file before adding Slicers. Open the file (xls format) in Excel 2010. The file name will appear in the title bar of the Excel window, and it will show [Compatibility Mode] after the file name. From the Save As Type drop down list, select Excel Workbook (xlsx), or select macro-enabled workbook (xlsm) if the file contains macros. 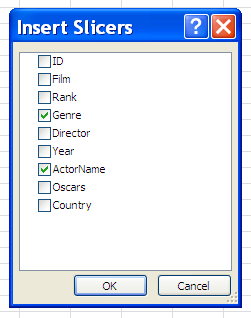 Enter a name and select a folder, and click the Save button. The file is updated to the new format, and you can see that extension in the file name in the title bar. Close the updated file, and then re-open it. 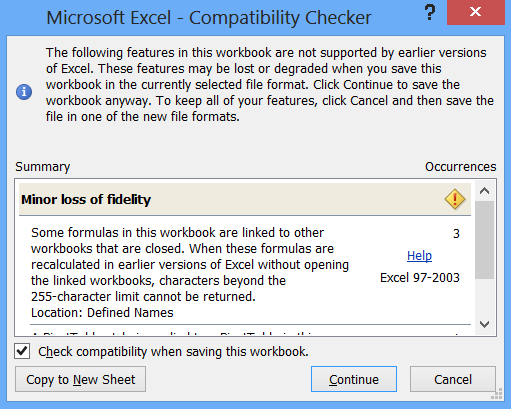 The [Compatibility Mode] after the file name will have disappeared, and you should be able to select a pivot table cell, and add a Slicer. 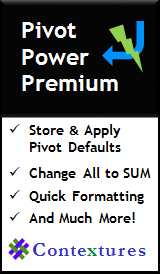 After following these steps, most files will allow you to add Slicers to the pivot tables. However, the occasional file might not show an enabled Slicer button, even after updating. You can build a new pivot table from the source data, and delete the old one. Or, you can try to repair the pivot table, by following the steps below. Open the file in Excel 2010, and click the File tab on the Ribbon. Click Save As, and save the file in Excel 97-2003 format (xls). Click Continue if a Compatibility Checker appears, listing the features that might be affected. Close the file, and re-open it. If an unreadable content message appears, click Yes, to open the file. If a Repair message appears, click Close, after reading the repairs information. The final step is to save the file back into the newer format. Click Save As, and save the file in Excel 2010 format (xlsx or xlsm). Close the file, and re-open it. The title bar should show the file name, without [Repaired] or [Compatibiltiy Mode]. 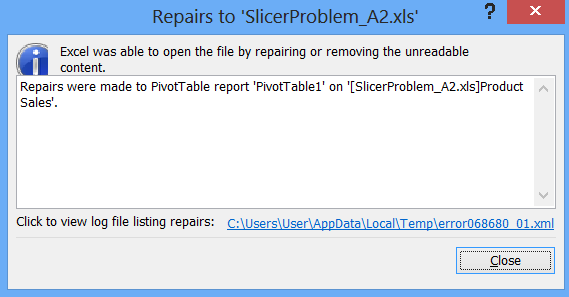 Then, select a cell in the pivot table, and if the repair was successful, you will be able to insert a Slicer.